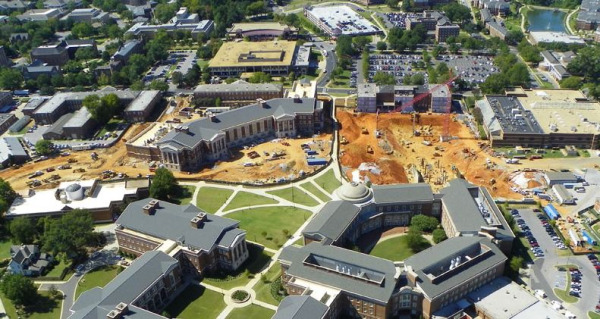 The University of Alabama is making a strong name for itself among the life-science community. UAB receives more than $400 million annually in research grants, and ranks in the top 25 in NIH funding, flanking closely to UCSD and UCLA. HOwever, there is surprisingly little sales representative traffic on campus. Biotechnology Calendar Inc. will be hosting an opportunity to Exhibit at UAB at the 2012 annual Bioresearch Product Faire™ Event. This event will allow laboratory suppliers and life science professionals to meet face-to face with over 325 pre-selected academic researchers as they actively seek solutions to their research challenges. UAB's new Science and Engineering Quad is now in Phase IV of a massive construction project, having just opened the doors on its South Engineering Research Center at the end of January. It sits across the Quad from Shelby Hall (completed in 2004, with 70 research labs) and the Science and Engineering Complex (already home to chemical and biological engineering research), which is scheduled for final completion in the summer of 2013. At that time it will include more than 100,000 square feet of research laboratories, faculty offices, graduate student areas, conference and meeting facilities, and other collaborative spaces. UAB's commitment to state-of-the-art science research, combined with the strength of its medical school, put it squarely in the ranks of the very best schools in the South. Our Science Market Update describes exciting new developments on Alabama’s research and development tax incentives. The article University of Alabama to Profit from Research & Development Tax Incentive by Jaimee Saliba ponts out that "One of the ways to encourage companies to invest in research is to offer them a tax credit incentive, and that's exactly what many states do, including, soon, Alabama. If the company does their own research, they get one tax break, but if they have it done by a public research institution like the University of Alabama Birmingham, they get a much larger break: 15% under Alabama's proposed new law. That's good news for UAB and other major research campuses in the state." And the rate may be even higher if Alabama tries to match North Carolina's incentive, which just went up to 20%.